Cody Hudson works as a multimedia artist, but is often considered a painter and a graphic designer. His use of graphic line work and a palette of bright colors have coalesced to create a body of paintings that reference his narrative of longing and hopefulness while also finding context within contemporary abstract painting. The artist is interested in the elemental use of shape as signifier, but he has gone further by allowing the forms that take place in his paintings to be direct extensions of the poetic content of the painting itself. 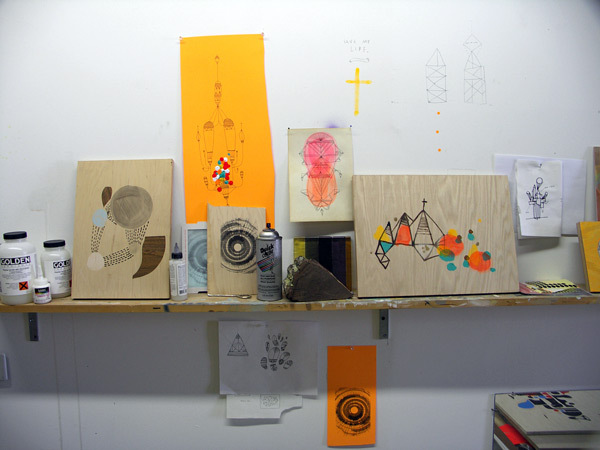 He has also focused on sculpture and text, introducing found and constructed wood forms, color and graphic images to his totemic structures. Ranging from tabletop constructions to large freestanding pieces, his three dimensional work has become a major focal point of his process as a whole.